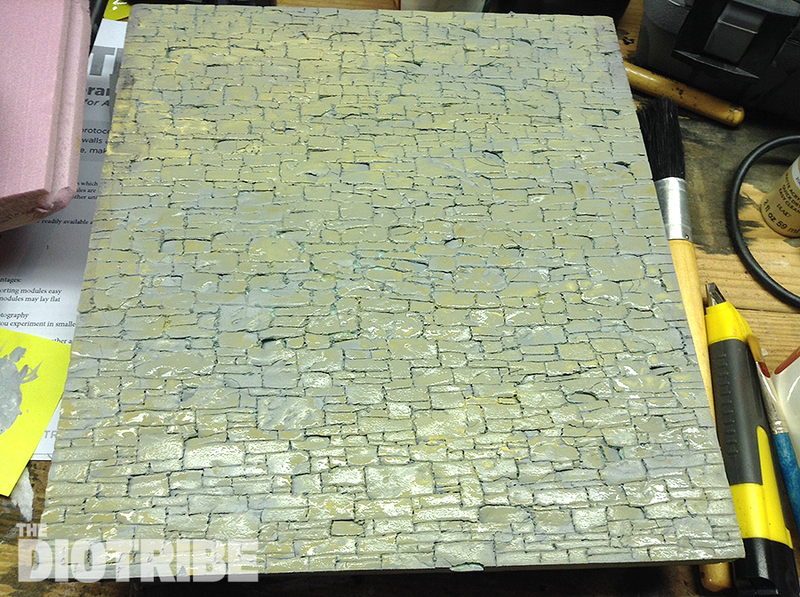 Creating a stone or rock wall for your diorama utilizes many of the same steps as making a brick wall, but a stone wall is much more forgiving since the lines don’t need to be precise. In fact, it’s almost impossible to screw this one up! 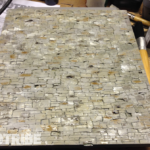 Start with a piece of 1″ thick insulation foam board. I primed mine with a grey color first, but you don’t need to paint it before carving. 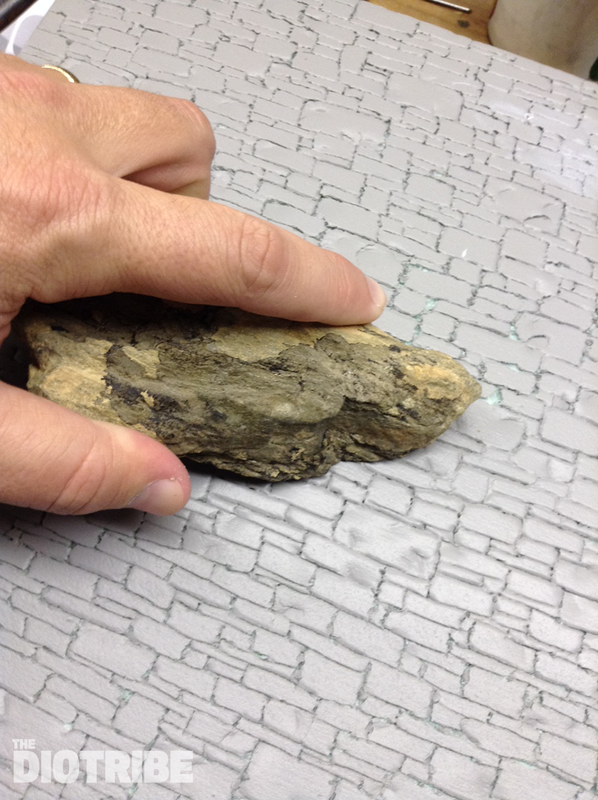 Figure out what scale rocks you want for your diorama, and start carving. I used a manicurist’s tool, but anything with a sharp tip would work. Draw out the rock shapes, being sure to vary their size and proportions. The process can take a bit of time, and I found that I needed to break up the rock carving into several sessions. Whew, that was a lot of work! 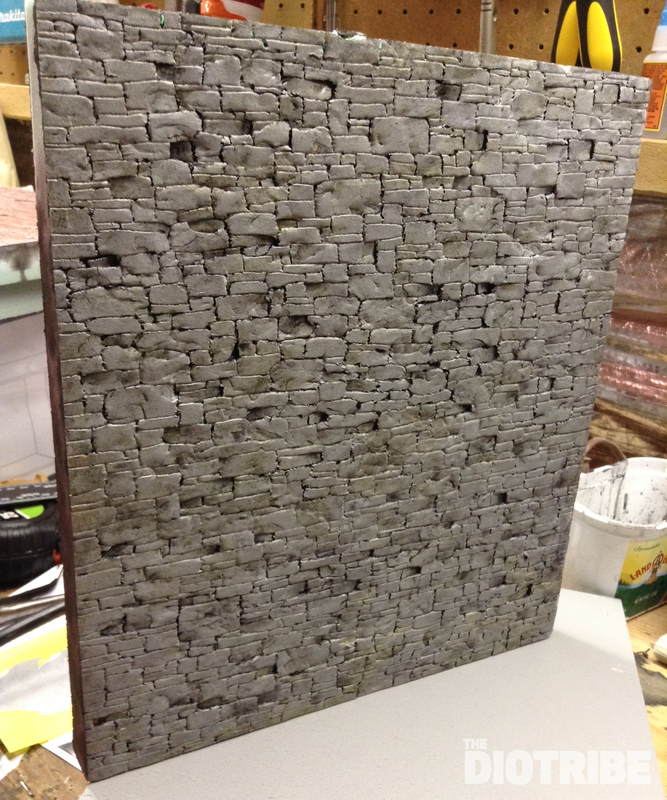 The next step is to rough up the surface of the wall, using any irregularly shaped object in your toolbox. I used a rock that had several interesting edges. Rotate the object and the wall, so you don’t get any repetitive shapes. 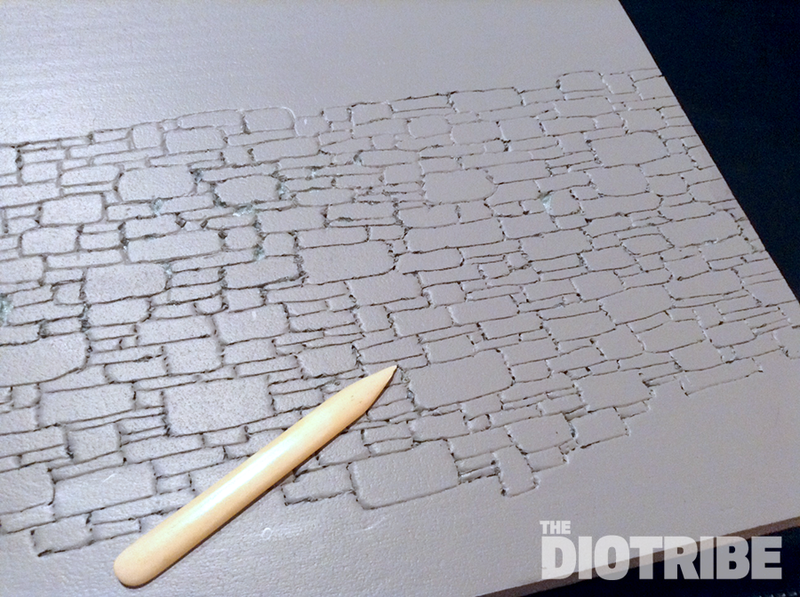 Punch in the edges of random stones using a paintbrush handle or flathead screwdriver. This step creates some really nice interest and shadows to the wall surface. All that distressing really paid off — this wall is starting to look good! 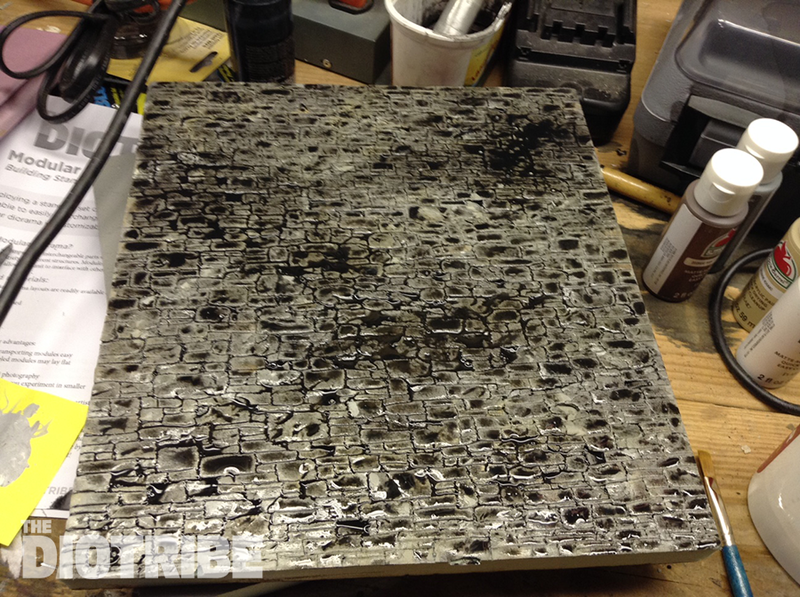 …and then I added some diluted grey and blacks to random stones, dabbing at the paint with a paper towel while it was still wet to make sure there weren’t any brush marks. This step always looks scary, but the results are worth it. 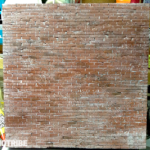 Coat the whole wall with diluted back wash. The black paint flows into the cracks and crevices and makes them stand out visually. 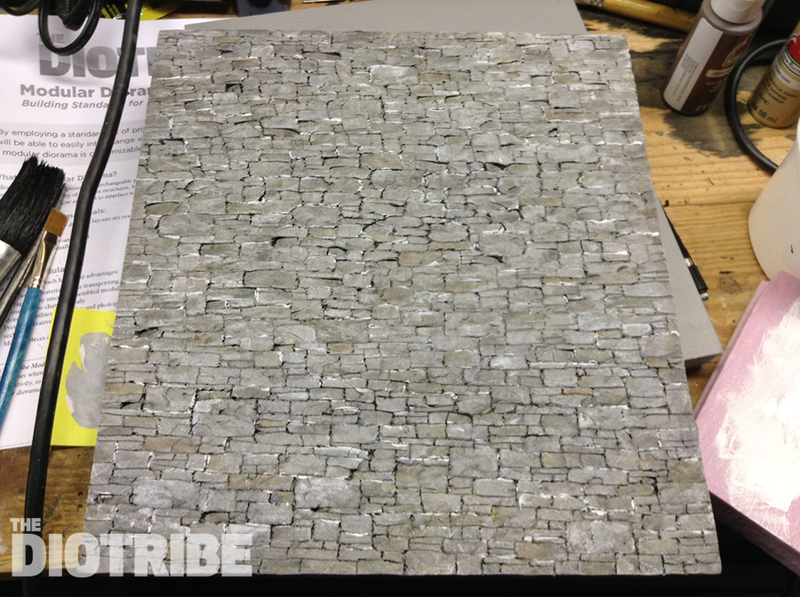 The stone wall is almost done! 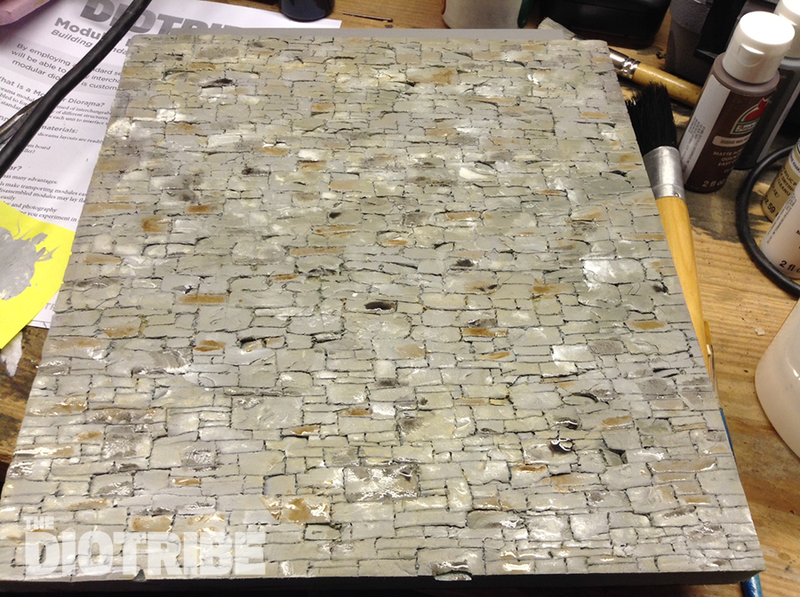 The black wash really added visual depth to the surface. The last step is to dry brush the whole wall with white paint. 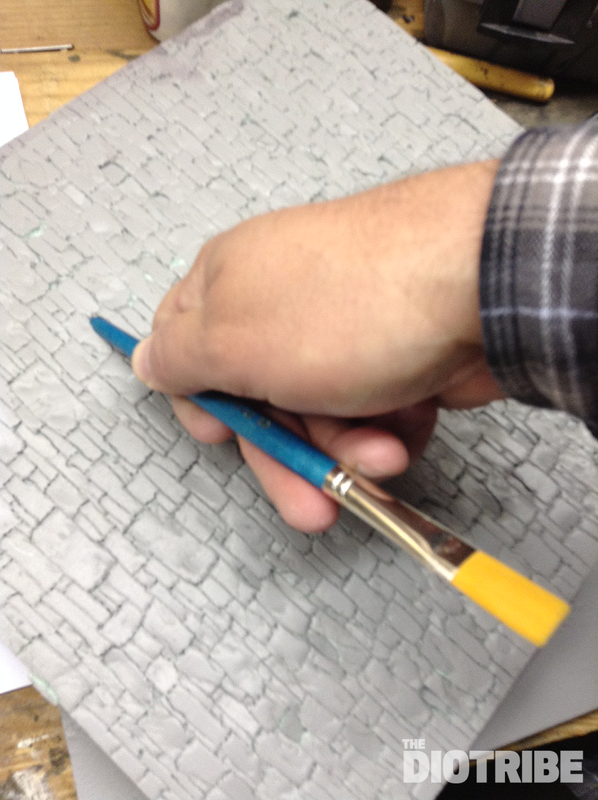 I also went in with a fine tipped brush and added white mortar lines randomly across the surface. This step truly puts the icing on the cake. Now, it’s time to take some pictures! 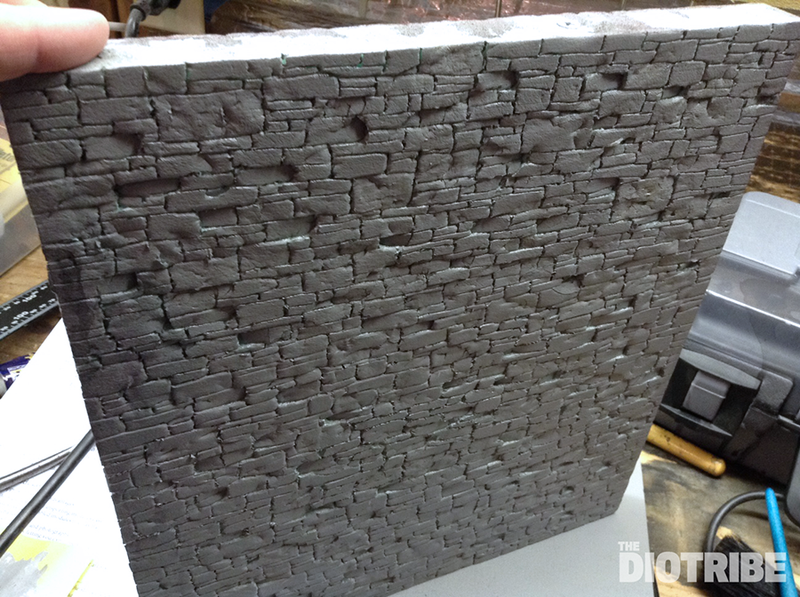 This stone wall will be a great backdrop for action figure photography. It’s versatile enough to be a wall in Wayne Manor, an ancient castle, or any number of other scenes. 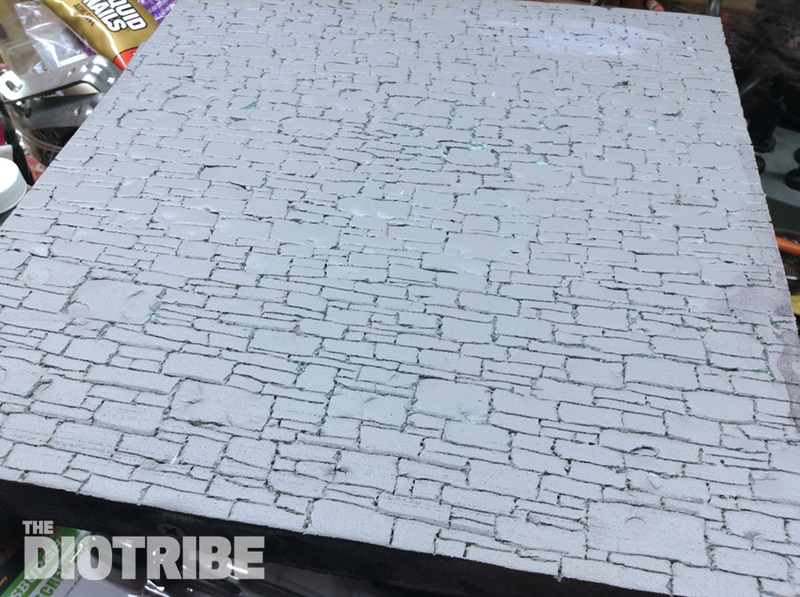 This project is great for the beginner or seasoned builder–it can take a bit of time to carve all the stones, but Rome wasn’t built in a day! About how deep should I carve the stones? You can vary the depth, but 1/8″ or so is what I did. 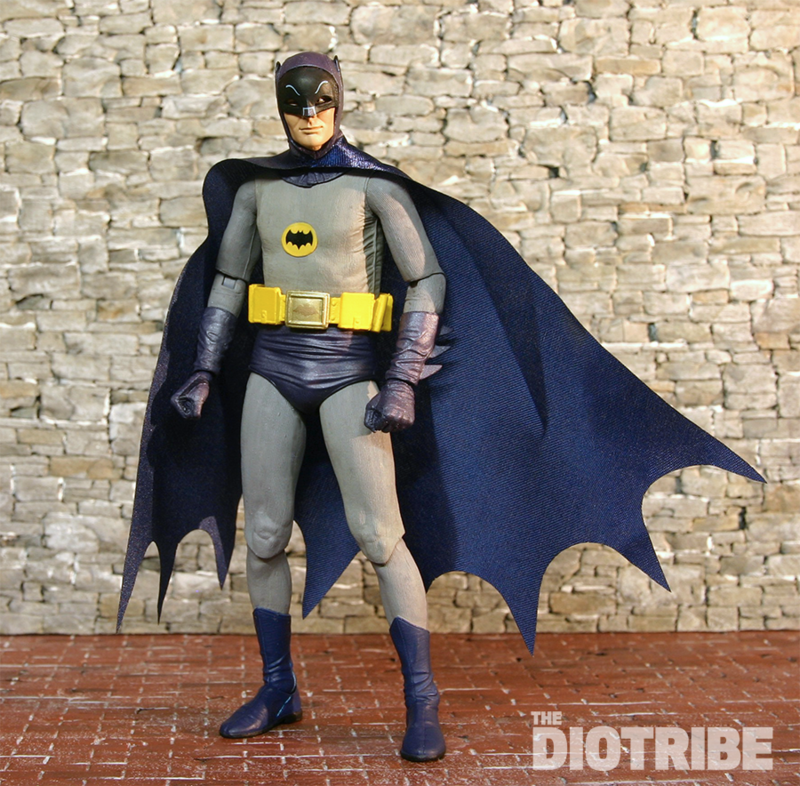 The DioTribe is a community of diorama builders and modelers who create action figure dioramas, model railroads, tabletop game terrain building, and more. 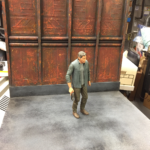 Small action figure dioramas can pack a punch! Looking for some abandoned buildings?